Not usually above average height, tendency to stoutness, sometimes awkward and walk with a rolling gait. Round face,full cheeks, tendency to double chin. Short nose but sometimes prominent at the tip. Grey or light blue eyes, pale complexion, wide chest and small hands and feet. 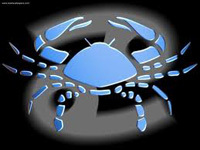 Cancerians are fond of change, novelty and travelling.Attached to relatives and home, inclined to public life, sympathetic,changeful and impatient. sentimental, sympathetic, emotional and over sensitive. Anger comes and goes quickly. Diplomatic, discreet and conventional. Changeable, ups and downs of positions and occupations in life.Of fertile imagination, sentimental, sympathetic and talkative. They are timid to face physical danger but are brave. Their temper is changeable. They have tenacious memory, and are industrious, emotional and conventional.They have strong emotional nature and are romantic, they also have psychic medium faculty. They have changeable nature. In love affairs they love intensly and have a nature of true hospitality. Of fiscal mind and have deep feelings of loyalty and responsibility. Cancerians are more interested to obtain small sums of money from different sources than a big amount, from one source. They are secretive, impressionable and magnetic. They should not be impatient, changeability and indolence are the other weakness. Health will be fragile in youth but will improve as age advances. Cancerians can be afflicted for lungs, flu, cough, asthma, bronchitis, tuberculosis and dyspepsia etc. Best suited for commercial career, they can not tolerate dishonesty in business etc. They accumulate wealth by dint of their own hard efforts. Good husbands and wives are born in Cancer ascendant. They are devoted to domestic life, to husbands, to wives sincere and sympathetic. Cancerians can sacrifice all for their children. Cancerians have fragile health in youth but as age advances they will pick up the health. Cancer rules chest and stomach.Nervous and worried. Digestive system and throat is to be taken care of. They should not be worring and should have a reasonable diet without alcohol.Guard against asthma, gastric problems, week digestion, rheumatism and sciatica.Diseases which can afflict Cancerians are afflictions of lungs, throat, flu,cough, pleurisy, dyspepsia, flatulence, nervousness, fear complex, hysteria,bile, gall stone, worms and boils on the chest. Cancerians are very careful for the money, being honest themselves,they can not tolerate any dishonesty and are not extravagant. As Jupiter is exalted in this sign, they accumulate wealth through their own hard labour. Fortunate in finances. Monotonous life without romance for Cancer born people, loyal sincere and affectionate in love, but they lack in expressing their loyalty and sincerity to the partners. They are honest and very true. They are stubborn and determined but also fickle minded and changeable.Cancer born people love their home, family and enjoy a settled family life. A good homely bird as a general rule but of romantic and passionate in nature.They make good parents for children, for them they will sacrifice their own needs and will provide education and all comforts to their children. Their children will also remain grateful, obedient and dutiful. Gain through children, inspite of the fact that their children will be frank and will not tolerate any imposition upon them, full of heroism, cool and calm minded,collected and sharp. Cancer born husbands are devoted to their wives. They would like to marry a homely girl, keep their wives cheerful, pleasing her in every way.Such persons are often dissatisfied and will be indulging in criticism in one way or the other and may interfere in routine household matters and create unpleasant atmosphere, which attitude should be avoided by them. Cancerians are open and frank at sight, but in reality they hide much from each others. They are impressionable and magnetic. Sensitive and retiring, romantic and imaginative. Easily influenced and will adjust to circumstances. Cancer born are devoted to their family. They love the home, and derive pleasure. Fond of collecting antiquities, constant journeys but even they keep home comfortable. A good family atmosphere,attend to their friends, host them to their full satisfaction. Love of home and children are their basic instinct. They desire to keep friendship on long standing basis. A good homely atmosphere prevails generally. Cancerians have commercial career and in things derived from water, conches, pearl, fish etc. May be sailors, in Navy, submarine, shipping departments, import or export, transport and travels. Also a good caterer, restaurant managers, orators, preachers, contractor or any good job in irrigation department. Interested in developing Vedic and sacred texts. Traits to be Corrected. Cancerians should be patient, endured and avoid sensitiveness. Indolence and changeability are their weak points and needs to be corrected. Be a practical hand, avoid inferiority complex and should not be over anxious, lazy and passive. They should control their emotions and develop spiritual side, should not be vindictive. They should overcome their timid nature and do not be very sensitive and extremely selfish where as patience and endurance should be cultivated. Sunday and Fridays are favourable for enjoyment and pleasure. Monday, Tuesday and Thursdays are days of success. Wednesday is good for journey and investments. But Saturday is an unfavourable day and may create disharmony, dispute,difference of opinions, delay in efforts etc.Lucky Colours. are white, cream, red and yellow. But blue and green should be avoided.Lucky numbers. Most vibrated numbers are 4,6, where as attracted numbers are 8 and 1. Passive numbers are 2,7,9, and numbers which will disagree and are to be avoided are 3 and 5.Lucky Stone. For Cancer born pearl in silver be used in 4th finger on Monday morning after offering prayers. But when Moon is afflicted, unfavourable or in fall one should use yellow sapphire plus pearl. These Gems be worn during bright nights.The day of fast is Monday. Which suitable time to marriage.